What were the origins of pounds, shillings and pence? The pounds, shillings and pence system has a tenuous link with Roman currency, but it was the invention of a French King, Pepin the Short, in AD 755. Libra, solidus and denarius are all Latin terms and solidus and denarius both Roman coins, but, the Romans did not use them in the same way. 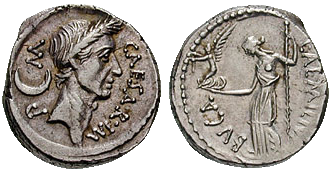 One silver denarius (plural denarii) was worth 10 asses (an as was a bronze coin). A solidus (plural solidii) was a gold Roman coin from a later period than the denarius. Its predecessor, the aureus, was worth 25 denarii. The solidus became currency in most of Europe after the end of the Roman Empire. Faced with a shortage of gold, the French King (or King of the Franks) Pepin the Short, could not mint gold solidii. So he introduced a new system in AD 755 based on a new silver denarius which weighed one 240th of a pound of silver. So there was a link between pounds in money and pounds in weight. He kept a link with the old currency alos as To maintain a twelve denarii were worth one solidus (or sou in France). The French used the solidus only as an accounting unit. At the time England was divided into into different Saxon Kingdoms. The dominant kingdom was Mercia led by King Offa, known for Offa's Dyke. His countrymen, traded with Europe and used the same gold solidus. Offa introduced the same system in the areas of England over which he had influence. The Saxons called the silver denarii pennies. They replaced earlier Saxon silver pennies, which were not part of the £sd system. The reason we used 'd' for pence is that 'd' stood for denarius. Of course 's' can stand for shilling or solidus and 'l' stands for 'libra', the Roman pound. So 12 denarii ('d') made one solidus ('s') and twenty solidii made one pound ('l').